Author’s note: Sorry for the delay on this one. I was not able to return to write this post until a few hours after the game. 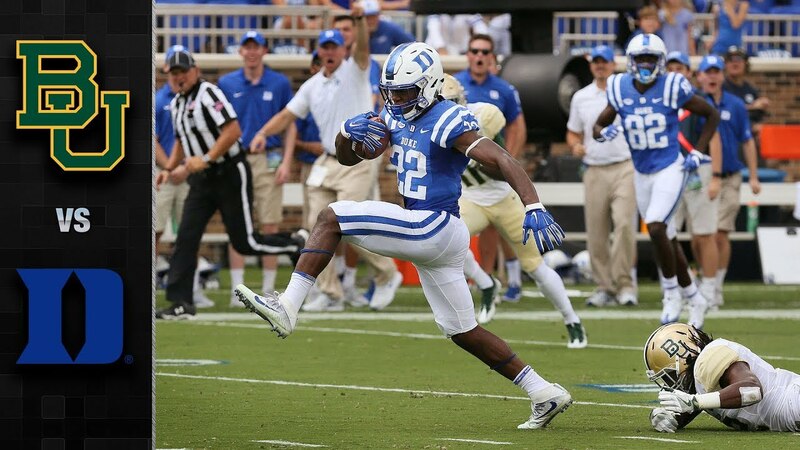 Duke’s Brittain Brown (22) breaks a tackle. Source: YouTube. Quentin Harris shone in his debut as Duke’s starter in Daniel Jones’s absence, whose left clavicle fracture is keeping him off the field and Harris on. Despite being absolutely riddled with injuries from last week, Duke was able to mostly keep it together and get the win, 40-27. The first half was hot for us on both ends of the field, in which the defense shut out Baylor and the offense scored 23 points, but the second half was where Duke was tested and demonstrated that they could prevail. Baylor was thinking comeback throughout the entire game. Kudos to them for the pertinacity to keep going. It’s not been very celebrated that Jonathan Lloyd made this catch one-handed for the epic touchdown during the second quarter. You watching, @SportsCenter? Despite Duke’s streak of seven scoreless fourth quarters being broken, Duke’s defense just looks better and better. The defensive line imposed their will upon the Bears: both Baylor quarterbacks both had a tendency to hold the ball a little bit longer than necessary and it burned them (when the refs weren’t turning a blind eye to the O-line’s repeated holding offenses. Just sayin’). Bleed blue. Duke will come back home to take on NCCU next weekend.